Posted February 5, 2014, in Student Alumni. Mitchell Larson was a work study student at WRI, majoring in History. 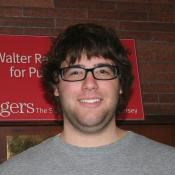 He hopes to continue on to graduate school at Rutgers and then Law School. Page last updated by Senator Walter Rand Institute for Public Affairs at 12:45 pm August 2, 2016 . This page was printed from http://rand.camden.rutgers.edu/2014/02/05/larson-mitchell/ at 4:05 PM Monday, April 22, 2019.